The aspect of our financial situation of which I’m most proud is our short-term targeted savings accounts. I’m proud of them because they are a solution to a recurring monthly-budgeting problem – regular but infrequent expenses – that I came up with all on my own. (Not that I’m the only one, of course – I just did it independent of those others.) And I actually think they’re really fun. 1) Take the stress out of the unexpected. Of course emergencies (however you define them) will come up and your emergency fund can take care of them. However, those expenses that you know are eventual and not-quite-emergencies (car maintenance, dental work) can still cause stress if you don’t have enough in your checking to cover them when they come up, and the targeted savings accounts can come to the rescue. 2) Create space for fun. On the frugal scale I tend to come down on the stingy side. In a given month, I sort of have to have my arm twisted to spend money on dining out and entertainment. By essentially making indulgence a budget category, it’s much easier for me to say “yes” to fun, even rather expensive fun. 3) Help prepare for large periodic expenses. I know that just trying to keep a large enough balance in our checking account to pay for something like plane tickets wouldn’t work out well for us. Money has a tendency to slide out of checking accounts unconsciously, at least in my experience. Multiple accounts also help me keep track of progress better than putting it all in one account. 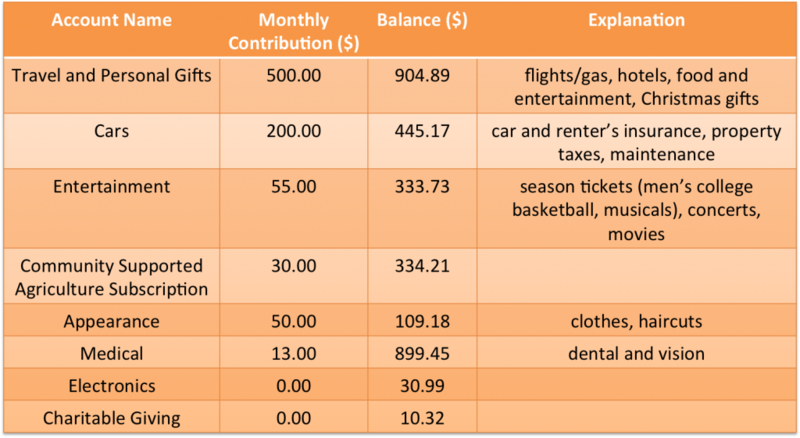 Here are our savings accounts and corresponding monthly contributions and balances. In addition to these accounts we also have an emergency fund and a nest egg. The Electronics account was created to pay for our laptops last summer. We contributed found money to it only and haven’t closed it yet because we still occasionally pay for accessories. The Charitable Giving account also is mainly funded by found money, at least until March 2012. Anyway our balances are pretty healthy at the moment so that is pleasing, but we do have some sizeable pending expenses – a haircut for me, repairs on both our cars, a wedding and a reunion to attend, and our CSA subscription. So they’ll be partially depleted shortly but very likely without stress. How do you cover large, irregular expenses if you’re on a tight budget? 22 Responses to "Our Short-Term Savings Accounts"
hi Emily, I noticed that the medical insurance cost was 13/month for both vision and dental. just curious about the coverage, is it an economic and good dental insurance? Good question, I can see how that could be confusing. Our health insurance is entirely paid for by our employer (no premiums to us). We are responsible for our own dental and vision expenses as well as co-pays for visits and prescriptions and such. The reason we are only saving $13/month right now is because the balance on that account is so high. Our goal was for it to reach $890, and we just haven’t spent much out of it because we haven’t needed dental or vision care recently. I plan to go to the dentist for a checkup in the next couple months, which will ding that account quite a bit and we’ll have to increase the savings rate to bring it back to $890. The revolving $13 at the moment is for a prescription that I fill once every 10 weeks. Does that make sense?